Discover nutrition information on the latest health foods to help you maintain a healthy lifestyle. Chia seeds are full of calcium and phosphorus to the extent that 1 tablespoon provides more than 10% of the recommended daily intake of calcium and more than 15% of phosphorus! Perfect to maintain bone density. 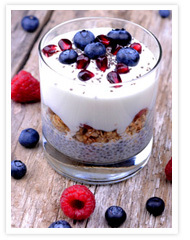 Chia seeds are rich in polyphenols and manganese and are also comparable with the antioxidants in pomegranate. * Studies have shown that compared to traditional oils, the consumption of seed oil or Chia oil, can reduce triglycerides and can help in a significant increase in "good" blood cholesterol (HDL). These seeds have real health benefits and are free of toxic compounds or phyto-hormones. 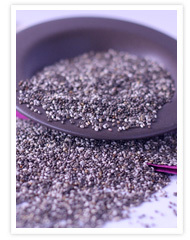 How can you enjoy these seeds on the Dukan Diet? You can easily add them to all of your dishes: yoghurts, smoothies, desserts, pâtisseries, salads and cereals: the ideas are limitless.